SimpleGreat v2.0 – Premium Responsive OpenCart theme with powerful admin panel, different layouts, and unlimited colors! 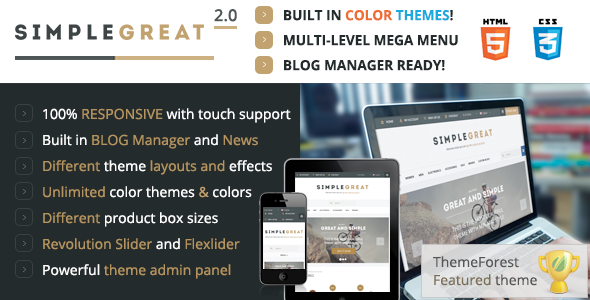 SimpleGreat is the most complete ultra-premium theme ever created for OpenCart, it 100% responsive, Blog Manager Ready, can be used for any kind of shop, have built-in color skins and powerful backend and it’s created with using the latest HTML5 and CSS3 features. Admin panel with easy navigation and 300+ configuration options allows you to change every thing in theme without learning HTML or CSS. You can manage colors of heme elements, select 500+ amazing fonts, apply 200+ pattern backgrounds and setup hundreds of theme settings and effects! This theme also available for Magento platform. Quick Vew Feature! – increase your shop sales! You customers can buy your products from EVERY site page, without visiting product page. Less clicks – more sales! Built in 8 color skins and unlimited colors for your own skins! Change ANY theme color without learning CSS! Save and Load color themes from admin panel! Added – Now you can change ALL theme colors via admin panel, without CSS! Added – Built-In 8 different ready to set color themes with DARK SKIN! Added – Fullwidth slider support (change in theme admin panel between boxed or fullwidth slider)! Added – Live price update for SELECT attributes with extra cost on Product Page (Beta). Can be turned off from theme admin panel. Fixed – Full screen background position changed to TOP CENTER without repeat. This theme supports OpenCart 1.5.5.1 – 1.5.6.x.